Social media should be a key part of a comprehensive marketing strategy. No longer just a way for people to share viral videos and stay in contact, companies who want to reach media savvy generations and established CEO’s alike should leverage social media as one of the most powerful tools in a marketing team’s arsenal. The question becomes, how do you engage with users across different platforms? We explore the best practices for integrating content that has been optimized for four platforms to help you grow your brand and your marketing reach. Facebook has set the golden standard in social sharing. It has the highest rates of usage amongst adults, with the the biggest demographic of users being aged 25-34 (29.7%). There are over 2.01 billion monthly active users, and 79% of online adults are on Facebook. With this market potential, the content you share on social media should be crafted with the same intentionality as that found on your site. This means strategy and planning should influence your content choices. Remember who you are targeting and how that audience is differentiated from more niche markets on other platforms. Don’t auto-post across channels, as that can mess with formatting (such as applying hashtags best suited for Instagram or Twitter). Keep posts under 80 characters and audience-focused with strong visuals to attract shares on Facebook. While you can certainly post a novel on Facebook, Buffer found that posts with 80 characters or less receive 66% higher engagement, which makes sense given that there are 1.15 billion mobile daily active users on Facebook. Visual content is more than 40 times more likely to get shared, so incorporating videos and other multimedia elements into your Facebook post is highly suggested, though not entirely necessary. Peak times for posting to Facebook to garner shares is Wednesdays at 3:00 pm, or Thursdays and Fridays between 1:00 and 3:00 pm. With this targeted approach, remember also that Facebook content is designed to engage user interests, so provide context and value for your users with what you decide to post. This could include thought pieces, blogs, videos, or anything which intrigues and entices views. Follow us on Facebook to see more of our social media tips, tricks, and insights. Twitter’s hard and fast 140 character rule should make crafting the perfect tweet easy. However, it can be challenging to create a witty, informative tweet that attracts views and grows your audience in less than 140 characters. One caveat of the Twitter character rule to keep in mind is that is that the limit does not include retweeted quotes, polls, or multimedia integrations. Including these elements in your Tweet is an ideal way to add additional content while still making it publishable. Hashtags should always be used to elevate your search relevancy, serving as viable keywords to target specific audiences and gain retweets and followers. Using them correctly will help grow brand awareness and target audience reach. Just don’t overdo it. Tweets with 2 hashtags have been found to to have almost a fifth higher engagement while those with three or more dropped 17%. The optimal time to post to Twitter includes Wednesday at noon, as well as 3:00 or 5:00 pm during the week. Keep best practices in mind when crafting a Twitter strategy targeted towards attracting views and new audiences. You should also take advantage of the connectivity of Twitter as a widespread, primarily mobile-based social media. Curate followers by replying and retweeting relevant content regularly. 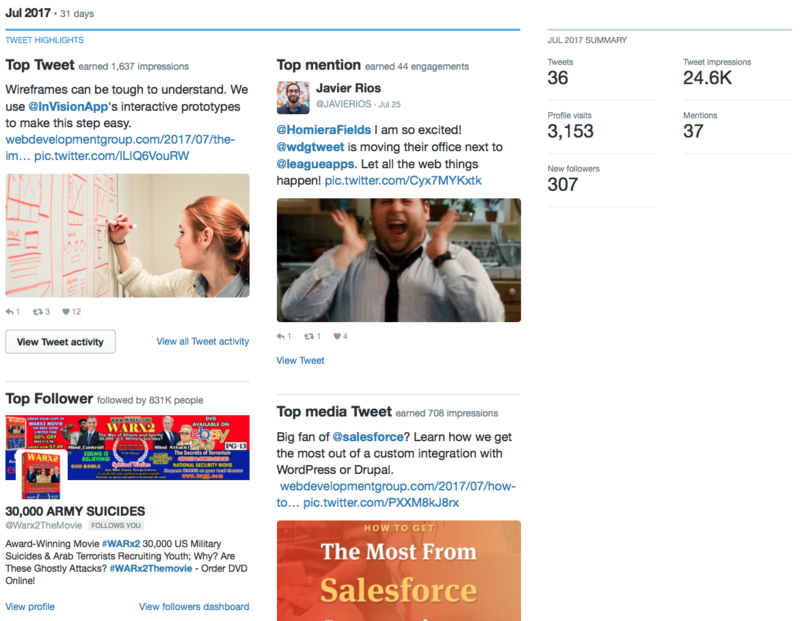 Twitter’s helpful dashboard provides administrators the ability to easily analyze and incorporate data feedback into their twitter habits. For example, with a new Twitter initiative in mind, WDG’s Twitter manager has greatly increased every metric in a single month. Impressions have increased 469.9%, while profile visits have shot up by 827.9%. Followers have increased by over 300 users in less than 30 days. Implementing these simple best practices certainly can pay off for an organization in the long run. Check out our Twitter feed and tweet us @wdgtweet with your best Twitter ideas! 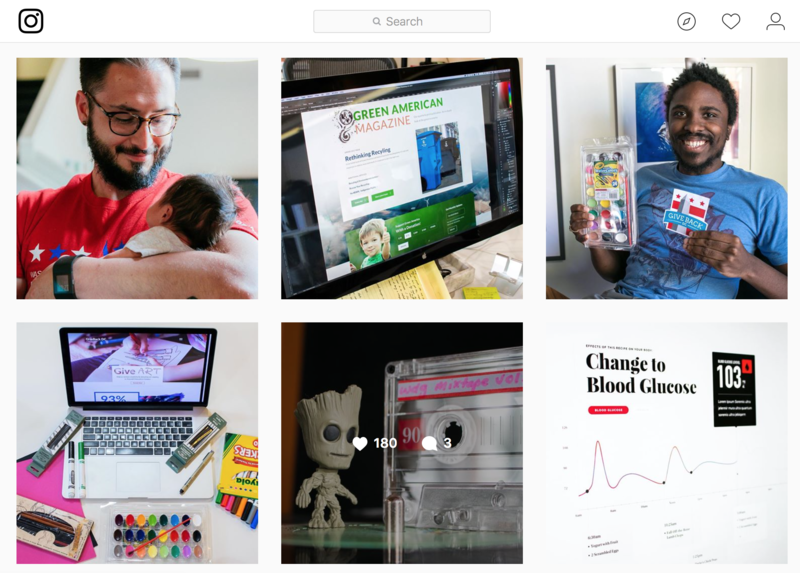 Instagram is first and foremost a visual medium. Branding is especially strong on Instagram, as there are more than 500 million users swiping between eye candy throughout the day. In fact, top brands have an engagement rate of 4.21%, which is 58 times higher than Facebook and 120 times higher than Twitter. Quality photography is a start, but smaller key elements can help improve the like and share rate of posts. Shopify’s recent study took this one step further, identifying “color” as the reason nearly 85% of people bought a specific product. Vibrant colors on quality images that are well curated is what makes you unique amongst your competition as users scroll through Instagram. 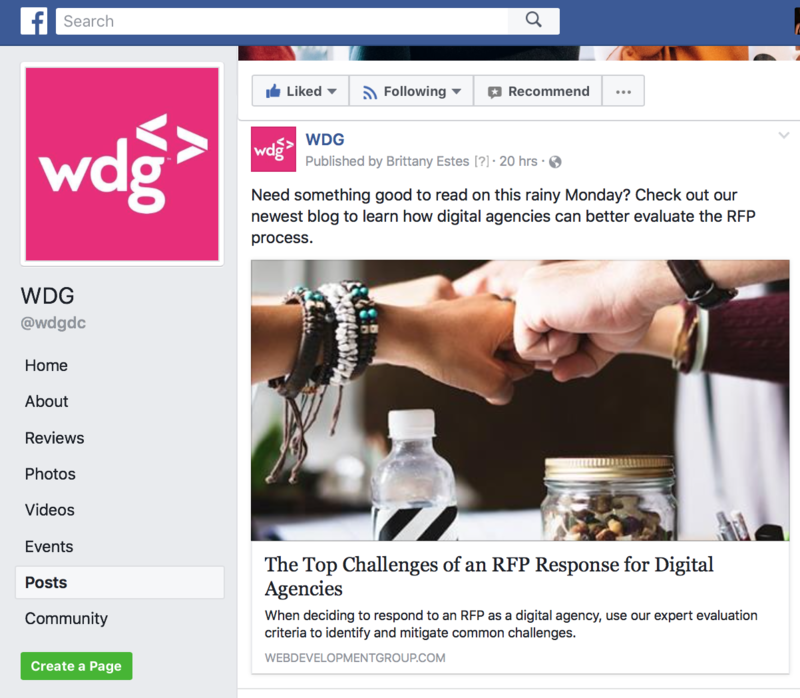 By following these best practices, WDG’s Instagram manager actually tripled our average user engagement in just a few months. Leveraging new features like Instagram Stories will keep you on trend and relevant with your target audiences. In one year, in fact, Instagram Stories has overtaken Snapchat stories with more than 200 million users. More than 50% of business on Instagram created a story in the last month alone. Integrated applications like Boomerang, Hyperlapse and Layout allow you to create interactive content, and scheduling tools like Latergramme send you notifications when it’s time to post. The type of content you post beyond visual images can increase followers and user engagement. Instagram contests are popular marketing tools that get users to repost images or branded hashtags. User-generated content and regramming is another tool that can be used to increase the content reach and volume. Hashtags of course should be used, and unlike Twitter, can be used in greater volume. Hashtags open your organization up to increased searchability. Posts that have at least one hashtag average 12.6% more engagement, though less than eight is recommended to prevent hashtag overload. Remember to also take advantage of popular events, trends, and holidays with timely posts. For best practices involving Instagram hashtags, check out Hootsuite’s complete guide here. Take a look at WDG’s Instagram to see the latest events taking place at our office. LinkedIn pages provide valuable connections to targeted audiences of potential leads, recruits, and peers. LinkedIn has made several advancements in their design to help encourage social integrations and promoted content that garners views from target audiences. LinkedIn is an incredibly strong tool that, when used correctly, can drive engagement with your company. With 467 million users worldwide, the professional nature of the site makes it an adept means of generating leads. The downfall is that LinkedIn is probably the least used, on average, of these five major social sites. The average user spends 17 minutes on the site monthly, while 53% of users spend between zero and two hours on the site per week. So what type of content attracts valuable views on LinkedIn? Thinking of it as a publishing medium can help you curate your content appropriately. Clickable content is especially strong on LinkedIn, which includes visuals and links found in effective calls to action. Remember to tailor the content to your LinkedIn connections as your target audience. Built-in analytics can give you a granular view of your followers by breaking down demographics by field, job title, geolocation, or company size. Leveraging analytics like these can allow you to effectively focus your marketing efforts towards these viable audiences. 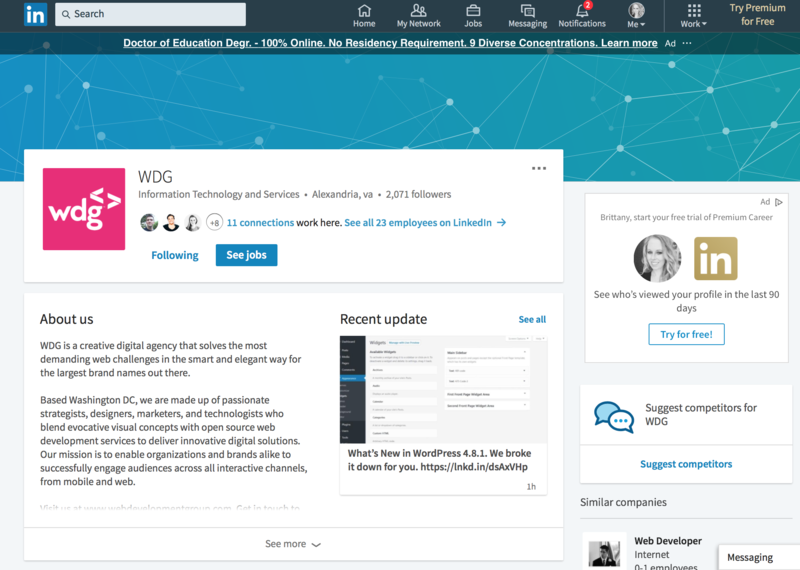 WDG’s LinkedIn profile is the opportune platform for sharing thought leadership, updates, events, and more. Demonstrate thought leadership as well through LinkedIn. This is a particularly strong platform for marketing your shareable written content, including blogs, white papers, and even e-books. As the largest professional social network, you should also take advantage of industry events, causes, and group that allow you to remain connected and relevant within your field. Employees can share branded content on their personal profiles, while LinkedIn Pulse allows you to publish original content to the platform with social shares and SEO capabilities. Remember that LinkedIn provides valuable analytics including page views, engagements, clicks, followers, and impressions for free. Leverage this data to your advantage when crafting curated content. Check out Sprout Social’s comprehensive best practices for LinkedIn to find out more. See our best insights and opportunities to join our team on WDG’s LinkedIn. Whichever social media you choose, make sure to tailor your material towards target audiences using marketable and shareable content. Be smart about which platforms you use by employing targeted posts with appropriate visuals, calls to action, links, and more. Employ analytics to refine and curate your content based on user feedback and demographics, and remember to take advantage of improvements and updates in each platform as they arise. All of these social platforms are effective stand alone marketing tools that engage audiences and increase branding outreach for any organization. Don’t forget to integrate these platforms with your WordPress or Drupal-powered website as well using a expert digital web design agency to handle all of your design, development, and strategy needs with custom integration capabilities. Want to know more about how social media can be leveraged as part of a custom strategy plan for your website design project? Contact our social savvy content marketing team or email us at [email protected]!